Not many people realise that undersea cables transport nearly 100 percent of transoceanic data traffic. These lines are laid on the very bottom of the ocean floor. They’re about as thick as a garden hose and carry the world’s internet, phone calls and even TV transmissions between continents at the speed of light. A single cable can carry tens of terabits of information per second. 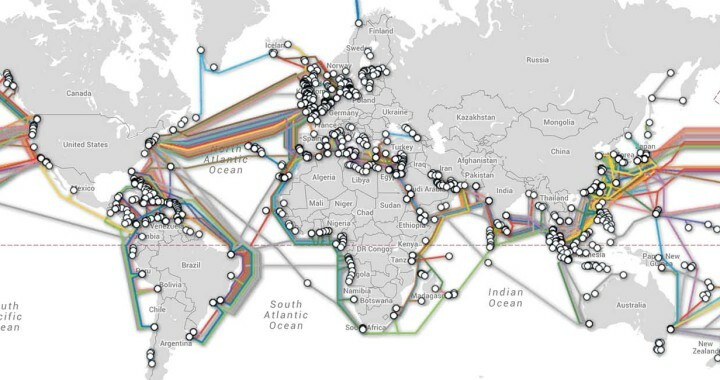 While researching my book The Undersea Network, I realised that the cables we all rely on to send everything from email to banking information across the seas remain largely unregulated and undefended. Although they are laid by only a few companies (including the American company SubCom and the French company Alcatel-Lucent) and often funnelled along narrow paths, the ocean’s vastness has often provided them protection. The fact that we route Internet traffic through the ocean—amidst deep sea creatures and hydrothermal vents—runs counter to most people’s imaginings of the Internet. Did not we develop satellites and Wi-Fi to transmit signals through the air? Have not we moved to the cloud? Undersea cable systems sound like a thing of the past. The reality is that the cloud is actually under the ocean. Even though they might seem behind the times, fibre-optic cables are actually state-of-the-art global communications technologies. Since they use light to encode information and remain unfettered by weather, cables carry data faster and cheaper than satellites. They crisscross the continents too – a message from New York to California also travels by fibre-optic cable. These systems are not going to be replaced by aerial communications anytime soon. The biggest problem with cable systems is not technological—it is human. Because they run underground, underwater and between telephone poles, cable systems populate the same spaces we do. As a result, we accidentally break them all the time. Local construction projects dig up terrestrial lines. Boaters drop anchors on cables. In addition, submarines can pinpoint systems under the sea. As a result, cables today are covered in steel armour and buried beneath the seafloor at their shore-ends, where the human threat is most concentrated. This provides some level of protection. In the deep sea, the ocean’s inaccessibility largely safeguards cables—they need only to be covered with a thin polyethelene sheath. It is not that it is much more difficult to sever cables in the deep ocean, it is just that the primary forms of interference are less likely to happen. The sea is so big and the cables are so narrow, the probability is not that high that you would run across one. The fact is it is incredibly difficult to monitor these lines. Cable companies have been trying to do so for more than a century, since the first telegraph lines were laid in the 1800s. But the ocean is too vast and the lines simply too long. It would be impossible to stop every vessel that came anywhere near critical communications cables. We would need to create extremely long, “no-go” zones across the ocean, which itself would profoundly disrupt the economy. Fewer than 300 cable systems transport almost all transoceanic traffic around the world. And these often run through narrow pressure points where small disruptions can have massive impacts. Since each cable can carry an extraordinary amount of information, it is not uncommon for an entire country to rely on only a handful of systems. In many places, it would take only a few cable cuts to take out large swathes of the Internet. If the right cables were disrupted at the right time, it could disrupt global Internet traffic for weeks or even months.